Like most people, my first contact with Virtual Reality involved a roller coaster demo, a DK1, and a bunch of people laughing at me because I couldn’t stand up during the ride. Even though I was mind-blown by the experience, I felt that VR would probably be the next gimmick that everybody forgets after a few months. The severe case of VR sickness that stuck with me for several hours after the demo surely didn’t do anything to change my mind. Needless to say that it took me several weeks before I wanted to give VR a second try, but I’m definitely glad I did. This second experience also involved a DK1 and a bunch of people laughing at me, but this time for a whole different reason. I was in the middle of a not-so-great horror demo when suddenly I was literally paralyzed by fear. I couldn’t move forward, even though I knew I was in a game. I was too scared. Call me a wuss if you like, but this experience totally changed my opinion of VR. From that moment on, I knew that VR would change the way we tell stories and touch our audience. I knew I had to work with virtual reality. I had to create a meaningful experience for this platform and play a part in the birth of what will be the next great tech breakout. After a few weeks/months of preparations, we presented our project to the CMF, who granted us the necessary funding to achieve our greatest ambitions. FATED is a first-person action-adventure episodic virtual reality game that combines rich storytelling, emotional moments, intense action scenes, and innovative gameplay mechanics. Set in the mythical age of Vikings, FATED tells a tale of courage and sacrifice where an everyday father and husband must do the impossible to protect his family from the destruction of their world at the hands of giants of old. Stay posted, as we will share a lot more information about the development of the game in the next few weeks. This blog will mainly serve two purposes. Obviously, we want to share our passion for FATED and hopefully get you as excited about it as we are, but we also want to share our experience with VR development. Virtual reality is new to almost everyone. There’s a lot to be learned, and we firmly believe in sharing our learnings so that others can use them to create awesome games as well. In the end, it’s the quality of the content we create that will determine the future of VR, and we most definitely want VR to succeed! So expect to see lots of Technical and How-To posts from our team. Hope you’ll enjoy! My name is Laurent Mercure and I’m community manager at Frima. 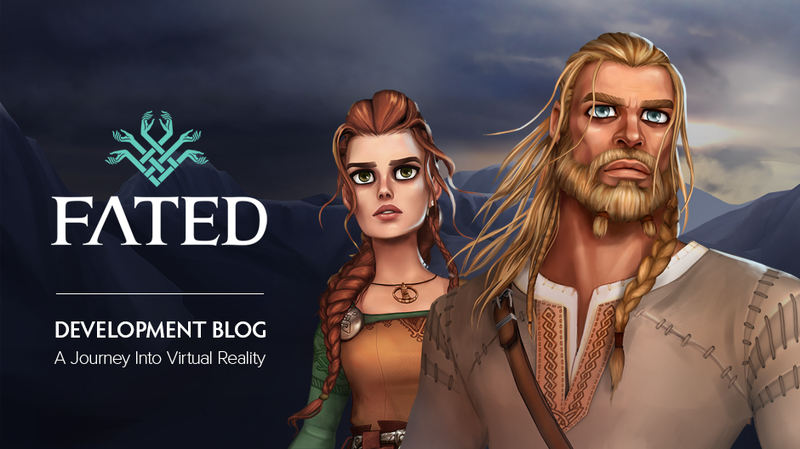 I am extremely thrilled to be opening this blog today as it will follow the development of our very first Virtual Reality game called FATED! We’re excited to take our first steps into the world of VR with such an amazing project. I will let Vincent, the producer, give you a little more details about FATED and where the idea for the game came from in his next post. As for me, my role on this blog will mainly be to engage with you guys in the comments, collect feedback and coordinate the content with my fellow team members. We’ll keep you posted weekly about our findings in VR and our progress in making the game. If you have a specific question on about VR development or on the game that we’re making, don’t hesitate to reach out. We might make a whole entry about it! All the social media platforms for FATED have launched today as well so if you’re interested in following our development on a day-to-day basis, you can follow us on Twitter at @Fatedgame or on Facebook.